From the Window Menu, choose Server Center (Command Shift D). Select Custom Fields at the top. Use the Gear menu to create a new field from the action menu. 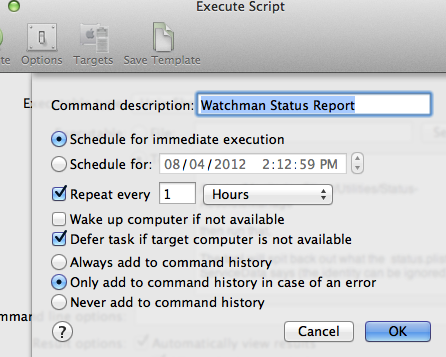 Set the field name to WatchmanStatus. Set the Field Type to Dynamic. Set Data type to String. Uncheck "Execute only when sending full inventory". Uncheck "Return execution errors as a result". Uncheck "Replace line feeds with spaces in result data". Check "Automatically assign to all computers". Set the toggle to Macintosh. The data source is Unix Shell Script. The Command line options field can be left blank. Execute as "System account user". Save All Changes to the Server. Close the Server Center Window. From the Window Menu, choose Computers (Command 1).